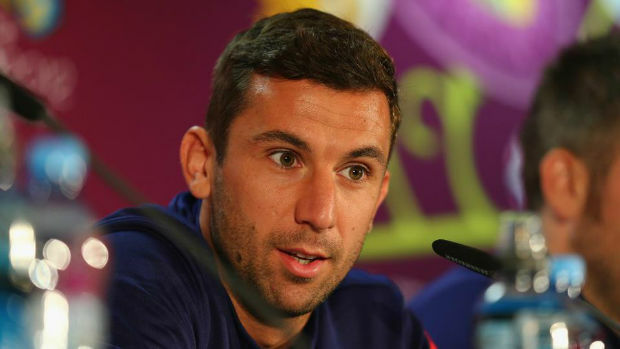 Darijo Srna is a famous soccer player who leads Croatian national team. Born on May 1, 1982, this talented sportsman has inspired the world with his exemplary skills. Adorn in a jersey numbered 33, Srna confidently takes the position of right back and can play all across the right wing. He is well known for his free kick and crossing abilities. The most capped player in Croatian national team history, Srna began his career at the age of 17 when Hajduk Split signed him. For the club, he has made close to 84 appearances which also include around 64 league appearances and scored 8 goals. At the club, he won “1999-2000 Croatian Cup, 2000-01 Prva HNL, and the 2002-03 Croatian Cup before leaving it in 2003 and joining Ukrainian club dubbed Shakhtar Donetsk. Srna took the role of a captain in the new club and made 29 –which include 19 in the league –appearances through it. He grabbed his first honor with the cup when under his leadership the club won Ukrainian Cup. Similarly, it was him who made the club to have a second-place finish in the Premier League. For his second season, the club won the Premier League and the Super Cup. On September 14, 2004, the talented player made his debut against Milan in main stage of UEFA Champions League. Since then, Srna dedicatedly played for the club and outshine in his performances. The first international debut of the promising player was made in November 2002 in a friendly match against Romania. His first ever goal was scored in 2003 against Belgium in Euro 2004 qualifier. At the Euro 2004 finals, however, he has only made an appearance as a substitute in matches against England and Switzerland as the national team was knocked off in group matches. Subsequent to Euro 2004, Srna became one of the important players in World Cup qualifying campaign in 2006 of Croatia. In the latter campaign, he starred in three matches and received praises for his performance. He is still remembered for his 30-yard free kick which brought the Croatian team ahead of Australia. For Euro 2008, however, Srna was dropped, temporarily, from league’s qualifying match with Russia, after pictures from late night party spree at a local disco surfaced. Nevertheless, he showed his worth to the world during the match against Macedonia where he played as a substitute. After the event, Srna was duly given the role of captain of the national team. Similar to his outclass performance in professional life, Srna is also quite humble in his life outside the stadium. He is philanthropic and buys match tickets for orphans and finances their conveyance to the field. During a war in the Donbass region, he purchased 20 tonnes of tangerines from farms close to Metkovic and distributed them to twenty three thousand primary schools. He has dedicated all his goals to one of his brothers who has Down syndrome. He is a father of young daughter Kasja who was born in 2010. He has married his longtime girlfriend Mirela Foric.